Heparin is an anticoagulant commonly used after surgery. It is used to prevent the blood from clotting too easily while the patient is spending more time resting and off of their feet than usual--which is when blood clots are more likely to form. Heparin is also used to treat blood clots when they do form, helping prevent the clot from increasing in size and preventing additional clots from occurring. 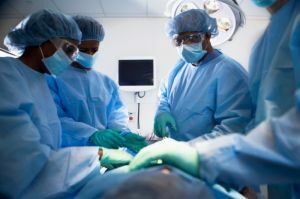 Surgery is a known risk factor for the formation of clots and increases the risk of blood clots significantly during the early stages of recovery, so it is common for surgery patients to receive routine doses of Heparin while in the hospital. Heparin is considered an important preventative measure during an inpatient stay after a procedure, and is often stopped when the patient is discharged from the hospital. Why Is Heparin Given After Surgery? Heparin is often given after surgery, particularly in patients who remain hospitalized for several days after surgery, to prevent blood clots from forming. Patients who are unable to get out of bed in the days following surgery are at greater risk of forming clots, making heparin a commonly used drug in intensive care units. For these patients, heparin is often given every eight to twelve hours around the clock, in an effort to reduce the risk of a life-threatening pulmonary embolism or clot. Kidney function will often determine how often heparin can safely be given to prevent clots. Heparin is given subcutaneously, meaning it is injected into the body in an area such as the abdomen, and can also be given intravenously (IV). There is no oral form of heparin, but some other blood thinners can be given in a tablet form. Lovenox, which is low molecular weight Heparin, is also frequently used after surgery and is used instead of Heparin, not with Heparin. Lovenox is given as an injection. Heparin dosages vary widely from patient to patient and are dependent upon the use of the medication. Small amounts can be added to IV fluids to keep an IV line flowing freely; larger amounts may be injected several times a day to prevent clotting. IV heparin is titrated, or adjusted, according to lab results, so the dose is unique to the patient if it is being given as a drip. The drip is often started based on ideal body weight and then adjusted based on the body's response to the medication approximately every six hours. This requires frequent blood draws to check how "thin" the patient's blood is periodically throughout the day, as overly thin blood can be dangerous and lead to unexpected bleeding. In children, the injection dosage is based upon weight in kilograms. While the dosages are significantly smaller for most children than adult doses, they are also individualized to each pediatric patient. If the patient is on a heparin drip, the drip will be adjusted according to lab results in the same way an adult's would be. It is not uncommon for bruising to appear around heparin injections sites. But small bruises are considered a normal side effect of administration and are not typically signs of a problem. A patient who spends an extended period of time in the hospital receiving three heparin injections a day may end up with a belly that is covered with small bruises in varying stages of healing. Too much heparin can cause the blood to become too “thin” and can result in bleeding. An overdose of heparin, such as giving an infant an adult dose of the drug, can cause bleeding so severe that it can result in death. The most common signs of heparin overdose include nosebleeds, blood in the urine or blood in the stool. Heparin Induced Thrombocytopenia (HIT) is a rare complication of heparin administration. HIT happens when heparin causes a drastic reduction in the number of platelets, the blood cells that cause clotting. This can lead to bleeding, and, in some cases, severe bleeding. In most cases, stopping the delivery of heparin is an effective treatment. Heparin is a well studied medication that has a strong record of preventing blood clots and thrombus--both of which can be life threatening. Side effects, aside from bleeding more easily, are rare but can be significant when they occur. For most patients, the reward of using heparin after surgery is far greater than the potential risks, but any concerns should be addressed with the surgeon or member of the team providing care while in the hospital. What Do Your PT, PTT, and INR Results Mean?